The Italian verb for taste is the irregular -ARE verb assaggiare. 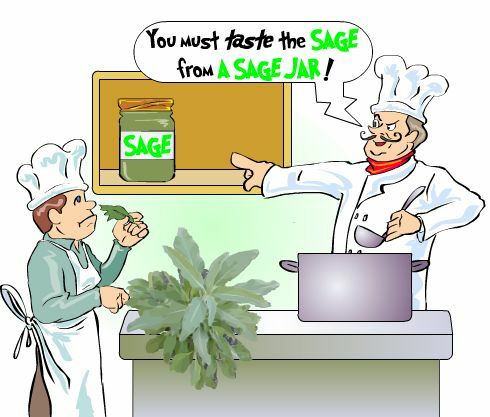 ... imagine you must taste the SAGE from A SAGE JAR! Assaggiare can also mean: to sample, to nibble, to pick at (food). - l'assaggio (nm) : taste, foretaste. These verbs remove an i from the stem before the endings beginning with i. Verbs conjugated in this way also include : alloggiare, adagiare, arieggiare, arrangiare, contagiare, forgiare, grattugiare, canceggiare, incoraggiare, assaggiare. Taste samples of Italian words using innovative memory techniques like Cartoon Memory Triggers! To remember a word, just think of the pic! non assaggiare (non) assaggi! (non) assaggiamo! (non) assaggiate! (non) assaggino! ✔ Assaggiare is an irregular -ARE verb, these being the most common verbs in Italian. ✔ Learn assaggiare and it will reinforce the pattern for ALL those other -ARE verbs. ✔ You can more easily remember words and verbs like the Italian for taste - assaggiare using the techniques of the world's Memory Masters. 200 Words a Day! Free Daily Italian Lesson Online - the verb in Italian for taste is assaggiare - fully conjugated. Italian Learning Made Fun and Fast with your free Daily Italian Verb Lesson - assaggiare.